Combine yeast, sugar and lukewarm water in a small bowl. Stir and set aside to ferment until bubbly, about 5 minutes. Sift together the flour, milk powder and bread softener. Tip into the bowl of an electric mixer. Add the bubbly yeast mixture, butter, egg, sugar, salt and lukewarm water. Mix on medium speed to form a smooth dough. Cover dough with a damp tea towel to proof for about 30-35 minutes or until doubled in volume. Divide dough into 12 equal portions. Roll each piece out flat into a longish shape on a lightly floured surface. 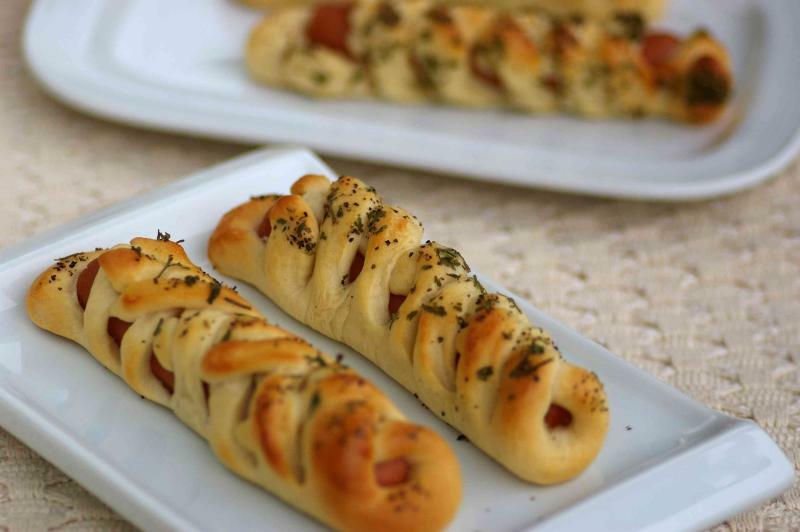 Place a hot dog or sausage in the middle of the dough. Sprinkle with ground black pepper. Make 5 cuts on the dough on each side of the sausage. Fold the left flap to the right and fold the right flap to the left to form a plait. Place the plaited bread on a baking tray. Set aside for 30-35 minutes to proof till doubled in size. Preheat oven to 190°C. Brush the top with glaze and sprinkle with some combined curry powder and black pepper. Add a sprinkling of dried parsley on top. Bake for 13-15 minutes or till lightly golden brown in colour.